We have added sorting functionality to the Manage Labels page. This feature will be seen on your lives sites on Wednesday August 5th. 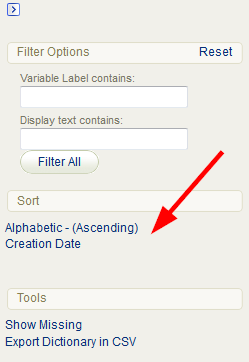 Site Managers can now view the labels in language dictionaries either alphabetically or by creation date. When new devlopment is released, new labels may also be created in the system. These are automatically updated in the default English dictionary and cascaded to all other dictionaries. Therefore, clients who have multiple languages may see labels in English instead of the language defined by the dictionary. Since Site Managers are reponsible for keeping their system's dictionaries up to date, we have added sorting tools to help them identify new labels. The Creation Date sort will move new labels to the top of the list so that you can more easily edit them.